According to Yahoo!, Greek archeologists have uncovered 37 tombs dating back to the iron age near the ancient city of Pella. "The tombs contain iron swords, spears and daggers, plus vases, pottery and jewellery made of gold, silver and iron." 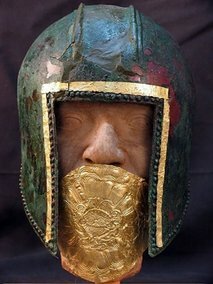 This bronze helmet and gold mouth protector were amongst the finds. To read the full article, please click here. Oh, yeah, forgot to mention. When I was taking an intro course to Greek History, my prof was one of those involved in excavating Philip's tomb. At least, they said it was his tomb then (1977). I understand there has been some controversy.